How to keep the paragraph settings as default in Microsoft Word 2007 - Blogger I.Q. 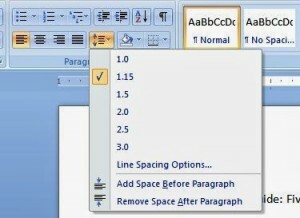 When typing in a word document you may notice that by default the line spacing is either 1.5 lines or 2 which is quite irritating while editing a normal, personal word document – nothing official. When we navigate to the Home > Paragraph > Spacing section – you can see that the ‘After’ field is 10pt by default. You will have to change it to ‘0’ (zero) so the spacing is minimal. But this setting has to be made everytime. So how to make this setting with zero line spacing as default? In the same window, there is button that reads ‘Default…’. Just click on it to make your current changed settings as default. That’s it! To change this default to normal or any other setting – simply make your changes and click on ‘Default…’ button again to keep the new settings as your default. Note that this change only works for the current document. If you open a new document, then the changed settings won’t apply. Please do write your comments below if you liked this post. Thank you!